One Of My Granddaughters Turned 11 Yesterday And So The Day Before, My Daughter Had Sent Me An SOS Cry For Help Because She Has A Sick, Teething 1 Year Old As Well As A 16 Year Old Getting Ready For A Formal Dance And Date Saturday, A 7 Year Old's Wrestling Tournament And A 14 Year Old's Soccer Game. The 16 Year Old's Dress Needs Altering And She Needed A Birthday Cake For The 11 Year Old And Some Games For The Party. Luckily, I Only Live About 12 Miles Away From This Beehive Of Activity And Am Happy To Help When Needed. Also Lucky Was The Fact That The Day Before The Party Was Semi Sunny. I Set To Work To Bake The 3 Tiered Cake My Grand Daughter Had Requested But The Clouds Kept Getting Even Thicker Than They Had Been And By The Time I Had Both Layers Of The Bottom Tier Done, My Ovens Were Only Able To Do About 260 Degrees. I Live Off Grid And Have No Regular Oven, Not Even Propane And Baking That Kind Of Cake On The Dutch Oven Is Not Going To Work. Sometimes Solar Cooks Have To Get Creative! This Is What I Came Up With. The 3 Tiered Cake Turned Into 2 Tiers And Since I Couldn't Bake The 2ND Tier, I Made It With Rice Crispies! 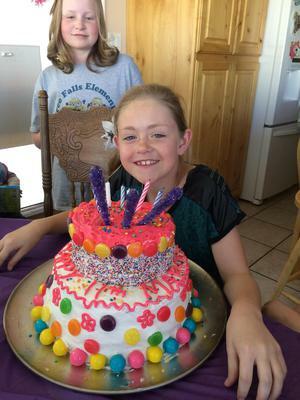 Despite The Unpredictable Spring Clouds, My Granddaughter Got The "Cake Boss" Style Cake She Wanted And All Is Well!